Are you pet and/or kid friendly? Well behaved pets and kids are welcome! We even have an awesome fenced-in playscape for the kids. We do ask that you keep all pets leashed while at the Tap Room and in the Oak Grove. Can I rent your facility for my event? We welcome large groups (especially with a phone call ahead of time! ), and have a large patio and oak grove with plenty of room to spread out. During our officially posted hours, we are always open to the public on a first-come, first-served basis. We have a food truck located on site, Jep's Southern Roots, that's open anytime we're open. We carry a variety of ciders from our friends at Argus Cidery. For non-alcoholic options, we have Maine Root sodas, among other choices. Are your beers vegetarian or vegan? Gluten-free? Currently all of our beers are produced with no animal products of any kind. If we ever do make an exception to that, we'll make it explicitly clear. We do not have the capability to produce gluten-free beer in our facility, but we do offer cider. 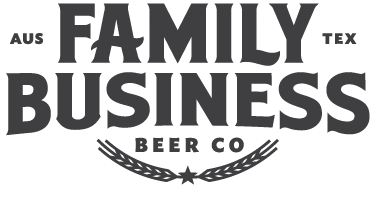 Can I take Family Business beer to go? Yes! Because we operate with a Brewpub license, we are able to offer beer to-go. We sell our own branded glass growlers, or you can bring in your own standard-sized (32 or 64 oz), clean growler. We also offer 16oz can fills of any beer we have on tap, and mix-and-match 4-packs are encouraged! Yes, we have started distributing a little bit in the general Austin area. For the time being, we are still draft-only. You can find the list of places that carry our beer here.